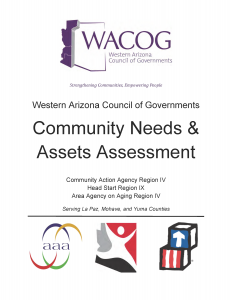 The Western Arizona Council of Governments Community Needs and Assets Assessments are conducted periodically in order to identify needs, assets, resources, gaps, and key issues within the tri-county area of La Paz, Mohave, and Yuma Counties. As a Community Action Agency, Head Start provider, and Area Agency on Aging, WACOG serves low-income and vulnerable populations across the lifespan. These documents shed light on needs and assets for the communities overall. They particularly focus on issues pertaining to low-income families and children that are potentially eligible for the Head Start program, older adults that currently or may in the future utilize the programs and services of the Area Agency on Aging, and all those that may use the community supports of the Community Action programs.